Some exocrine systems require exertion of active forces to mediate secretory vesicle content release at late stages of exocytosis. A universal feature of such systems is formation of an actin coat around each vesicle, which is thought to facilitate the force necessary to complete the process of vesicle secretion. We use the Drosophila larval salivary gland to investigate this process at high spatial and temporal resolution. By setting up a live imaging system for cultured salivary glands, we follow the dynamics of actin coat formation around “glue”-filled vesicles, and vesicle content release. Combining this system with genetic tools, we were able to uncover the major factors mediating this process. 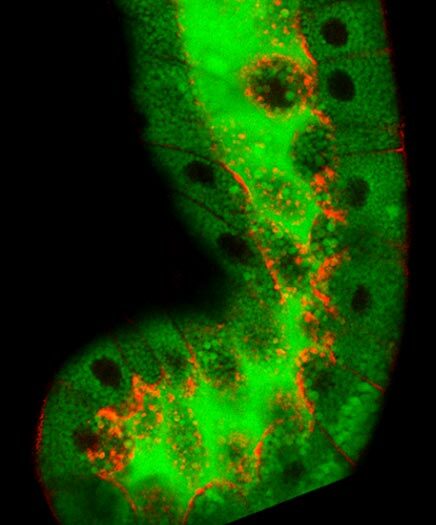 The study of secretion in Drosophila is complemented by analysis of actin structures in secretory cells of the mouse pancreas. We identified Dia-generated actin cables in the acinar cells of the exocrine pancreas, and could follow migration of secretory vesicles along these tracks. In the beta cells of the endocrine pancreas, we used live imaging of filamentous actin to identify new sub domains that are critical for the elaborate function of these cells. The edges of the beta cells serve as sites for contact with neighboring cells, are rich in actin, and concentrate the cellular machinery that is required for sensing glucose and secreting insulin. These edges are also rich in actin-based filopodia that increase their surface area dramatically, and facilitate contact with gap junctions in adjacent cells. Salivary gland secreting glue proteins (green) by actin-coated vesicles (red).